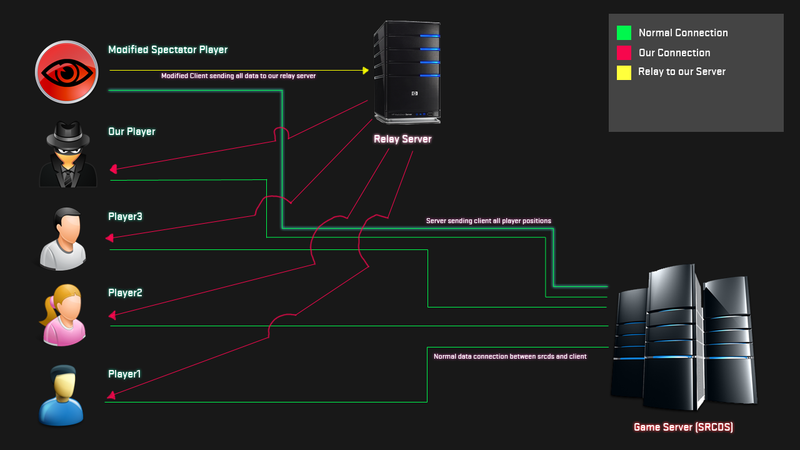 These systems are utilized on Valve official servers however there are other techniques 3rd parties use to extend the functionality such as the anti-wall feature in SMAC which is used by leagues use to prevent people wall hacking. The concept presented in this post looks at another way of bypassing this and allowing the user to see the enemy players from anywhere on the map. !! !Note I’m not going to reveal how this works just yet. This is a concept point only!!! Although we are going to be looking at Valve’s own instances of srcds they deploy in match-making this should work on any other server too. There is a way, well rather various ways to interact with the game server and receive information that is not suppose to be disclosed to you. I’m going to be utilizing one of those ways in this demonstration. There are limitations to this method as you will soon see but it works fine so far. The advantages and disadvantages are pretty obvious. You get the information you need about the enemy team but you pay the price of a fifth player being absent. This entry was posted in Main and tagged csgo, ESP, far, hack, poc, pvs, Valve. Bookmark the permalink. GitHub API Error: Must specify two-factor authentication OTP code.